The Blubrry Beginning Podcaster Guide was a big hit at the Podcast Expo. And as promised we continue to grow the document. Revision 7 has been posted and features a section on the legalities of podcasting. The section was written by our General Counsel Barry Kantz. As always, contributions from the community are welcome. Download a PDF version of the Blubrry Beginning Podcaster Guide here. Browse, share and even listen to the guide here. This batch of photos comes courtesy of our Creative Director Brian Yuhnke. Angelo has posted a number of pictures from last weekend’s Podcast and New Media Expo. Most photos are from the hearty partying in the RawVoice suite. Check it out! The team is set up at booth 315 on the floor of the Podcast & New Media Expo. Come by and get some swag or see a demo of how your Blubrry podcasts can be played on the new iPod Touch. We’ve got buttons, stickers and some very cool show notes pads that we know podcasters will love. We’ll also be recording audio and video during the day. If you come by we might be able to get you on the Brrycast or U See Blu video podcast. If you’re hanging later this evening we will be having a party in our suite at the Marriott. Stop by the booth to get an invite. If you are a video podcaster and want people coming to your site via the iPhone or iPod Touch to be able to play your videos instantly then have we got a deal for you. Although most video podcasters have embedded flash players, those players will not be compatible with the Safari mobile browser. And direct links to the video file may not work if the file is too large. QuickTime video files embedded in the web page seems to work fine though. And it just so happens that our Blubrry Podcast Player automatically embeds your videos into a small web page. 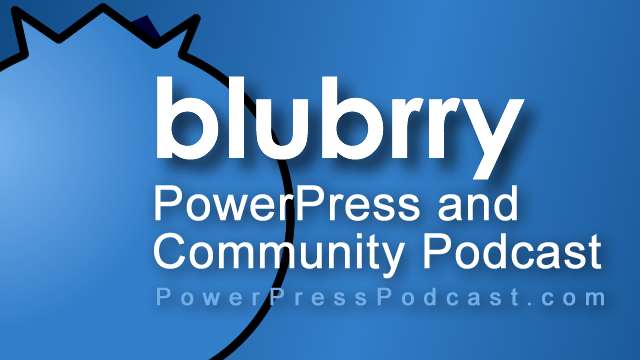 Find out more about the Blubrry Podcast Player on our forum here. So if you’ve got iPod compatible videos and want people coming to your video podcast website via the new iPod to be able to play your content straight away, then the Blubrry podcast player is your best choice. Our crack graphics expert Brian Yuhnke is working on a special icon that you can use to add to your web pages so visitors know where to click if they’re using an iPod Touch or iPhone. Stay tuned to this blog for updates. I just received my iPod Touch today and I’ve been experimenting with the web surfing features. Of course I made my way to blubrry.com to get a feel for the experience. You can surf Blubrry pretty easily using the included Safari web browser. If you click on direct links to audio files they will start streaming straight away. If you click on direct links to video files you get an error message saying that the page is too large for Safari to download. If you open the Blubrry player, properly formatted videos will stream in the browser and automatically switch to full screen mode. I ran this test by viewing the Average Betty video podcast and one of my own video podcasts. This is very initial info but exciting to know. If you have observations about the performance of this site on the iPod or iPhone please let us know in the comments. Its amazing that we’re already into football season here in the United States. Seems like yesterday that I was celebrating opening day for baseball. But the nights are cooler here in the northeast and the leaves are starting to turn. That means that every Saturday and Sunday millions of people are getting their college and pro football fix. Of course there are plenty of people turning their football passion into football podcasts. Here are links to some professional and college football podcasts that can be right here on Blubrry. The first of two videos from the recent PodCamp Philadelphia event.